The following interview is brought to you by Derek Sit, volunteer writer at TEDtoChina. The original Chinese version of the interview can be found here. 居於香港,是一個幻想著自己在熟悉的城市像過客一樣流浪的傢伙. 正一本正經的學習著成為一個會計師, 但心裡邊總覺得世界如此陌生如此不為人知, 總是搞不清楚是A還是B. 目前正努力嘗試在TED的世界里為自己找到一個答案. Have you ever thought about how much time our volunteer translators need to put in one 15-minute TED talks? One hour? 2 hours? Or 5 hours? Well, I cannot say it exactly. But I am pretty sure the unit is ‘days’ rather than ‘hours’. You can never imagine how much they have contributed if you have not translated before. Dear readers, when you are enjoying the wonderful ideas the talks bring us, try not to forget the silent translators who bring the talks to you. It is high time we acknowledged and recognized them by getting to know them more. Therefore I would like to introduce Bill Hsiung, a distinguished traditional Chinese Translator, to all of you. Bill is currently in USA. He has translated 48 talks so far, ranking 1st among all traditional Chinese translators. In the following Bill will share with us his story with TED. How did you discover, and started translating TED videos? Bill: Around late 2006 or early 2007, I watched a video about multi-touch panel on Youtube by Jeff Han. About 9 minutes, and very wonderful. I googled some keywords from the video and discovered the official website of TED. From then on, I visited TED.com periodically. TED talks are all wonderful, simple and straightforward. Therefore one could always spare a bit of time to watch and appreciate those talks no matter how busy s/he is. Around March 2009, I found a Facebook group named ‘I translate TEDTalks’. The TED Open translation Project (OTP) caught my sight, and I started following it. Before that, I was a Traditional Chinese volunteer translator for MIT Open Courseware (although I didn’t apply and complete the translation project officially). I also helped translate Facebook into traditional Chinese (Taiwan area)． I did not join OTP immediately due to other commitments. Meanwhile, the project was still in the process of testing. In May, I applied officially to be a member of the project as I got through with other projects. Around two weeks after I joined the group, TED publicly launched the translation project, and welcomed interested parties to join. You have translated 45 talks so far, while most other traditional Chinese translators finish less than 10. What is the driving force? Bill: My motive has been very simple from the very beginning. There are many TED talks which I like. And I just want to take this opportunity to translate and share the talks with other people, making it easier for Chinese people, especially those using Traditional Chinese, to get access to those wonderful speeches. Timing is another reason. I had more leisure time. Therefore I translated quite a few talks. In August 2009 I moved, changed my job and was occupied by several tedious matters, thus withdrew myself from the project for a while. Luckily I was still invited to TEDActive held in Palm Springs in February this year for free, as I had translated a considerable amount of talks before the temporary stop. I met different volunteer translators from TED OTP around the world as well as the main organizers of TEDx activities. We shared with each other our experiences and enthusiasm. This wonderful TEDActive experience encouraged me to pick up this project again. And I believe that I will keep on until I finish translating all the talks that I am interested in. (TED.com publishes one talk per day from Mondays to Fridays, and publishes selected talks during weekends. The number of TED talks is increasing continuously!!). Translating TED talks would probably become one of my long-term commitments. Other than that I am greatly encouraged by the thank-you letters from the public who acknowledged the time we put into this project and the contributions we make to the Chinese community. Are there anything interesting or unforgettable during your process of translation? Are there any particular videos that are inspiring to you? Bill: Unforgettable….probably the moment I just joined the project ~ the platform for translator was still quite simple then. It was quite difficult to get in touch with other translators (Now you could easily search them), not to mention finding a translator working on the same language. It was mission impossible, considering the operating system we had then. However, the translated videos will not appear on TED.com until months later if you can’t contact other translators or ask them to review the talks( TED will only publish talks on its official websites after it is reviewed by a different translator). Thus I went for the simplest option. I went over the names of the thousands of registered TED users on the website, and tried to find those names with the tag ‘TED volunteer translator’. Then I looked into spelling of the names, and guessed whether s/he is a Traditional Chinese translator or not. Lastly I would contact him/her. It appeared to be quite cumbersome now, and therefore quite unforgettable. Any tips on translating that you would like to share with us? Bill: First of all, for those who are interested in joining OTP, please read carefully the information available on the official website of TED Open Translation Project before you actually get started working on the talks. (This includes: translation guidelines, suggested formats, FAQ and help). The TED has been listening to different translators, and publishes their suggestions on the official website for reference after summary and editing. Reading them help fresh volunteers get on the right track quickly, and answers questions they may have. Hopefully our translators could make good use of them. Generally speaking, the most prevailing guiding principles for translating TED talks are: avoid word-to-word translation; try to express the ideas using Chinese grammar and sentence structure (sometimes it is necessary to use inversion, or substitute Chinese slangs for original phrases). TED aims at ‘idea worth spreading’. Translating the spirits and ideas of speakers is far more important than wordings only. The performance of Traditional Chinese Translator has always been weaker than that of Simplified Chinese Translators. What is your opinion and can you suggest some solutions for improvements? Bill: Haha ~ probably I would not agree with you (‘has always been weaker’). I think you are solely looking at the amount of talks completed. Amount is definitely one of the indicators. Not the only one, even not the best one, but the easiest understood one. The number of talks completed by Traditional Chinese translators is indeed far less than that by Simplified Chinese translators. But if we take the number of translators into consideration as well, the performance of the two groups are comparable to each other. The number of simplified Chinese translators is around twice as much as that of traditional Chinese translators, and so is the amount of talks completed. If we further take account of the population size using simplified Chinese and traditional Chinese, I would say the performance of traditional Chinese translators should have been much better than its counterparts. (Currently Traditional Chinese is used daily only in Taiwan and Hong Kong. Simplified is more widely used in Mainland China, Singapore, Malaysia and other Chinese communities). Besides, when the project just got started last year, there were still very few translators. The amounts of talks translated into Traditional Chinese were once more than that in Simplified Chinese. That is why I don’t agree with you. But the hard fact is that we pale in terms of amounts. We should reflect on that and think about solutions. Firstly, traditional translators are generally very demanding about the quality of their translation products. They may go back and forth during reviews, making corrections unweariedly several times. This slows down the translation process. But it is good. It guarantees the quality of translation. We need not and will not change this. Secondly, there are fewer Traditional Chinese Translators in OTP. This is something we can work on to improve. We have been in collaboration with TEDxTaipei to increase TED Open Translation Project’s visibility in Taiwan. We will to interact more actively with schools, and introduce the project to students, especially those majoring in foreign languages, through teachers. What is more, traditional Chinese translators have been too independent, and therefore not well-organized among themselves. We don’t have an interactive platform like TEDtoChina or TCTC google group (for better coordination). There are other organizations and websites in Taiwan who are translating TED talks. It is a pity that they remained independent after the launch of TED Open Translation Project. It is a kind of waste and inefficient for different groups to work on the same talks on their own. TED project is a long-term commitment. I am satisfied with the speed with which our traditional Chinese translators are doing now. That keeps our translators occupied. They will develop a habit of translating TED talks once they are free. Spanish and Bulgarian volunteers translated much faster than the speed with which the Official TED talks increase. Volunteers may direct their attention to other stuff as they have no videos to translate. This is not good for long-term commitment of translator communities. This is something we must not ignore. It might not be that good to translate with too high speed. Can you talk about your expectation of development of TED among Chinese communities? What impact would you think will TED bring on us? Bill: haha~ I only hope TED will be recognized by more Chinese. As to the future development and impact it will have, well, I am neither an employee of TED, nor someone influential. Just as what TED curator Chris Anderson said, TED has its own life, no one knows where it would go, we are also curious about its future. I could only guess the impact would be positive. So what do you think about Bill through this article. To me, rational, passionate and earnest. I believe his sharing of the tips on translating would benefit both current and fresh translators. His opinions on the development of traditional Chinese translators are particularly inspiring to me. I am currently in Hong Kong. I think TED could also spread its ideas more actively in this wonderful island besides Taiwan, and get recognized by more Hongkongers. I have seen volunteers working on this. And from them I see promising futures. Pitch into the creation of eminent marks with the original source created by informational ghostwriting site. Good squeak in order to be popularized collegiately by getting top know their resources and trying this ghostwriting site. 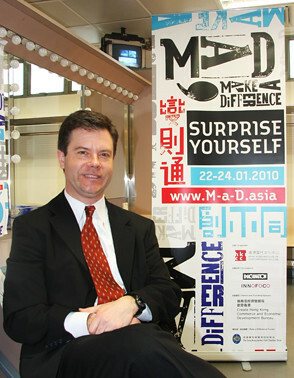 Alex Counts, President and CEO of Grameen Foundation, gave an interview to Journalism and Media Studies Centre (JMSC) at University of Hong Kong during “MaD 2010” conference organized by Hong Kong Institute of Contemporary Culture. He talked about technology, social media, and microfinance in China. TEDtoChina writer Jinxin Ma brings us from Hong Kong her interview with Alex Counts. Microfinance, a worldwide movement to grant as many as possible poor people access to high quality financial services, has rooted in China since early 1990s. Only in recent years; However, has the general Chinese public been witnessing its growing momentum thanks to the development of technology and emerging social media channels. As one of the leading NGOs in this sector, Grameen Foundation has inspired globally many seed projects including Qifang.cn, a China-based, fast-growing, person-to-person student loan program, showcasing how philanthropy and social enterprise can help the unprivileged weaving their dreams. Counts believes that technology has a huge positive impact on the development of microfinance. “We have been involved in technology and microfinance in almost ten years, as a major program of Grameen Foundation,” said Counts. Grameen Technology Center started in 2000 has proved how they take it seriously. The Chinese version of MIFOS, an open source system that initiated by Grameen Foundation is expected to function in a year. Yunus, the founder of Grameen Bank, talked on “China Microfinance Summit” held in Beijing in November 2009, saying that microfinance in China should be in the form of social enterprise, and Counts agrees with Yunus’s “for-profit, but non-distributing” social business model. He also points out the challenges Grameen Foundation faces in China: the first is that they “can provide grants but not loans”, due to Chinese regulations; and the second is that “a lot of people that can be microfinance entrepreneurs in the rural areas are migrating to the cities”. Despite the problems which are “solvable”, as Counts states, he sees mostly big possibilities in China. Counts served as a Fulbright scholar at the Grameen Bank of Bangladesh in 1988, right after he graduated from Cornell University in the United States. The Grameen Bank and its founder, Dr. Muhammad Yunus, later won the Nobel Peace Prize in 2006. Grameen Foundation was founded in 1997 by Mr. Counts with a mere $6,000 in seed capital and a charge from Yunus. It is Washington, D.C.-based nonprofit organization and has grown to a global network in 22 countries. 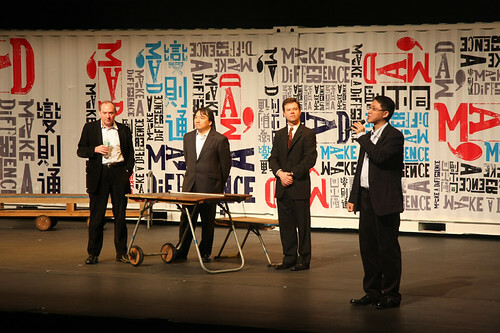 MaD 2010 was held at the Kwai Tsing Theatre on 22-24 January, 2010, in Hong Kong. Over 800 participants from Hong Kong, Mainland China, Macau, Thailand, South Korea and the U.S. attended the event, which was composed of 26 talks and 27 workshops, challenges and chatrooms. A Chinese freelancer located in Hong Kong, focusing on new media, digital marketing, social enterprise and civil society development in China. Worked at various industries including media, non-profit, real-estate, etc. with a Master of Journalism and a Bachelor of Social Sciences (Major in Political Science) from the University of Hong Kong. Fond of poetry, photography, architecture and documentaries. Enjoys TED as it is one of the best platforms to meet intelligent, passionate and solid people. When you click educational site obviously is an outstanding portal to buy papers.